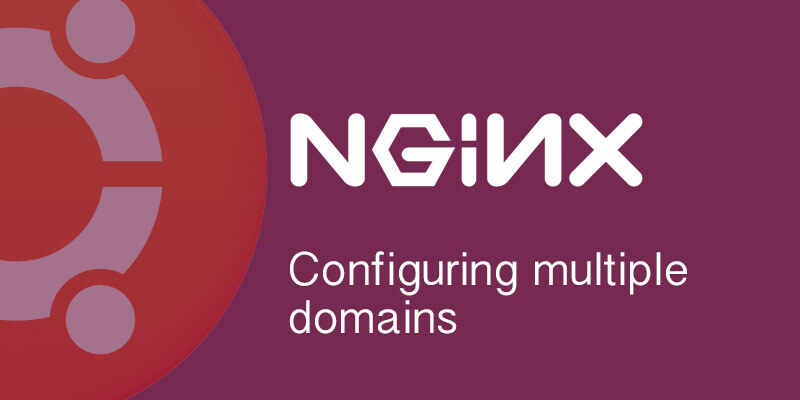 Learn how to install Nginx and configure it for multiple domains on Ubuntu. After the installation, you can check which version has been installed. The default configuration file for Nginx is /etc/nginx/nginx.conf, and we’re free to add our domains to this configuration. However, it is strongly recommended not do. The single, biggest reason not to combine all domains in one configuration is that it will become very unwieldy, and cumbersome to maintain. Rather, it is advised to create individual configuration files for each domain, placing them in the /etc/nginx/sites-available directory. Our first domain will be named domain-one.com. So let’s create its configuration file. Create the root directory to host our website’s files. Create the Nginx configuration file under /etc/nginx/sites-available. For easy reference, name the configuration file after the domain name. Open the configuration file in a text editor. During this tutorial we will be using VI, however, Nano is a good alternative. Our configuration file is created. It’s time to define our domain and its individual settings. Open the configuration file in a text editor. For our example, we use VI; however, feel free to use Nano as an alternative. We set the server directive and tell Nginx that this configuration maps to all domain requests that match domain-one.com over port 80. Finally, let’s tell Nginx to attempt to serve the request as a file. If a file doesn’t exist, attempt a directory; otherwise, show a 404 Page not found error. This location directive will map all requests to anything access the root of our domain. Since there are no other location directives yet, all requests will map to it. The configuration file should now look similar to the following example. Validate the configuration file has no syntax errors. This is good practice for doing any work on a production server, as a simple syntax error will prevent the Nginx service from starting, preventing visitors from accessing your site. Provided no errors were found, enable the site. To do so we’ll need to create a symbolic link of the site configuration file in the sites-enabled directory. Start or restart the Nginx service. If Nginx is already running, reload all configuration files without stopping the service. Verify that Nginx is running. Our additional domains is nearly identical to adding our first one. The only difference is we’ll need to change the server’s hostname. All domains can be served from the same port, which uses 80 as a standard default. Our second domain will be, creatively, named domain-two.com. Let’s begin setting it up. Create the directory to be used as our web root. Create the configuration file. As with our first domain, we’ll name it after the domain name. Configure the settings exactly the same as the first domain, except change the domain name and root directory. Validate the configuration file, checking it for syntax errors. If Nginx is already running, reload the configuration files. It isn’t enough to see the service is running to verify that everything is working as expected. As a good practice, visit your sites to ensure both are loading fine.